Polarized sunglasses are essential for fishermen, and understand how various tints & colors can go a long way. Eye protection is a no-brainer when staring at water as glare can cause lead to UV ray damage and can blind you without the right pair of sunglasses. 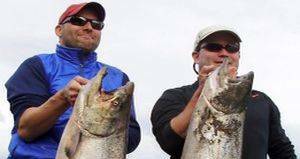 However, for advanced fishermen, choosing sunglasses with the right color or tint can help you see fish in the water, differentiate colors, movable targets, and stumps to improve your rate of success. Sunny, bright days often are the culprits behind loads of glare. Choosing grey or smoke tint lenses can easily block out the brightness, reduce glare, and bring out amazing contrast while by a lake or fishing pond. Although some might find smoke lenses to be hard to see through, even a cloud lens or yellow lens can be a great alternative. On days with less sunlight like low-lit, cloudy days, amber or yellow tint lenses enhance bright objects underwater. For people who love bass, bed fishing is a common activity during spring and amber or yellow lenses will really help. If you face even rain or like to fish later in the day, lenses with these tints work well towards the end of the day. Even with helpful tips when choosing polarized sunglasses, simply testing out a pair of sunglasses can really show you a lot more about your vision. Visit our practice today for your next eye exam & find out more about ensuring good eye health & improving your fishing activities.